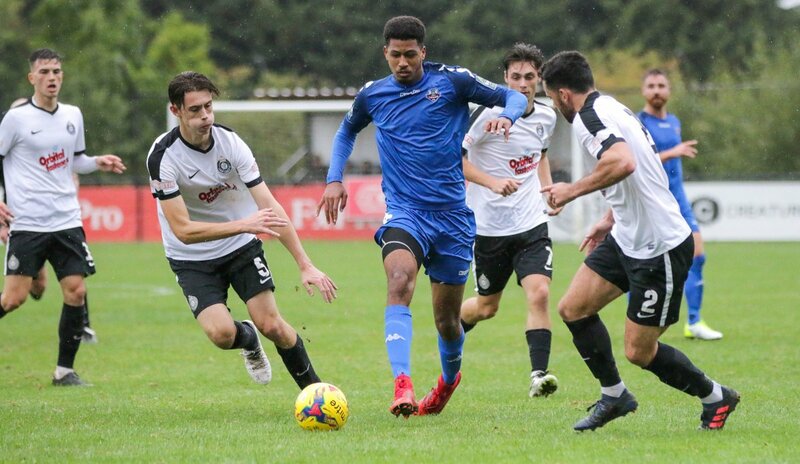 The Rooks rode their luck in the second half against a spirited Kings Langley side to force another FA Cup replay, reports Stuart Fuller. New signing Dan Darbyshire came straight into the starting XI, with Michael Dome-Bemwin suspended after picking up his second yellow in the competition in the last round against Farnborough and joining Ronnie Conlon, Harry Read, Alex Malins and Marcus Elliott in the stands as the game started in persistent rain. The home side looked to get the ball quickly out to Micthell Weiss on the left-hand side, who caused problems in the opening period, forcing Lewis Carey into a couple of early saves. Rene Howe also proved a threat to the Rooks defence, holding the ball up well and troubling the normal unflappable centre-back pairing of Frankie Chappell and Lloyd Cotton with his physical presence. After a flurry of corners for the home side, Lewes started to come into the game and a Charlie Coppola shot was well saved by Bennett as it skidded across the wet surface. New signing Darbyshire had a couple of promising runs at the Kings Langley right-bank but couldn't find a final ball into the box. The Rooks best chance of the game came after twenty-five minutes when James Hammond's free-kick hit the bar and Charlie Coppola missed the target with the follow-up. Jonte Smith then forced Bennett into a save at his near post as it looked like The Rooks had put their early nerves to bed, and sure enough in the 39th minute they took the lead. Lawson was the quickest to react to a loose ball in midfield and moved it out to Darbyshire who beat his man, ran into the box and fired the ball across Bennett. His shot struck the post but Jonte Smith was on hand to score his fifth goal of the season. Lewes were forced into a substitution at half-time with Luke Blewden replaced by Nico Cotton. The home side looked menacing from the first minute of the second period. Jorell Johnson hit a superb volley that flashed wide in the 50th minute and soon after the home side had their goal as Howe was given the freedom of the penalty area. His shot was well saved by Carey but Syla was on hand to smash the rebound home. The Rooks were on the back-foot as the home side went looking for the win. They forced corner after corner but the Lewes defence held firm. At the other end a run into the area, followed by an accidental one-two with a defender saw Omarr Lawson almost sneak the ball under the Kings Langley keeper but he saved the ball with his feet. Nico Cotton then broke free and chose to pass to Coppola rather than shooting himself but the ball fell behind the Lewes youngster. At the other end, Lewis Carey once again earned his keep with two smart saves in the final five minutes. In the final minute of the five added for injury time by the referee, Lloyd Cotton proved to be the Lewes hero by heading off the line. Few Rooks fans will begrudge the result, knowing that the home side probably shaded it. Lewes have certainly played better this season and extended their unbeaten run to ten games in all competition. Darren, Ross and Codge know they will have to play better on Wednesday if the Rooks are to progress into the next round of the Emirates FA Cup. Post match, skipper Frankie Chappell spoke to Stuart Fuller about the game. More pictures from James Boyes can be found here. The replay will be on Wednesday night at The Pan, kick off at 7:45pm, meaning a new date will have to be found for our Bostik League Premier Division game against Corinthian Casuals.